Birds of a feather flock together, right? There is nothing quite like the spirit of collaboration and when you are an entrepreneur with big dreams, it is great to share your vision with likeminded people. The question is where to find other people with epic ideas like you, and at the same time get financial backing to launch your dream into becoming more than just a dream. 1. Kickstarter – With over US$220 million raised with over 60,000 projects so far, Kickstarter has a colossal online following and a simple submission process. The only major downside (for some) to Kickstarter is that you have to be a US citizen with a social security number to create a project. 2. 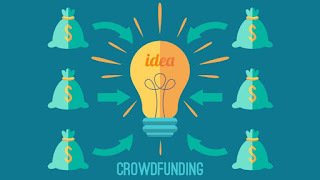 Indiegogo – Focus is placed on independence on Indiegogo and you will find a lot of interesting projects and charitable causes. Unlike Kickstarter, everybody is welcome – not only people living in the US. The downside is that the site will charge a 9% of the fund fee is your campaign fails to reach its goal – although you do still get to take the funds away. 3. Rockethub – What makes Rockethub different is that members can work with top-notch companies and brands to help them raise interest. The site has two options, FuelPad is geared for crowdfunding and LaunchPad is an ideal space for creative people like musicians, artists and photographers. 4. GoFundMe – Aimed simply at raising money for whatever you can imagine. If you are desperate to go on holiday in Mexico or to buy a pet chinchilla, this is the place for you. This site’s motto could easily be ‘Sharing is Caring’. 5. Razoo – More concentrated on causes than profitable projects, Razoo has fancy technology to back up its upward trajectory in the crowdfunding world – and even a handy iPhone app to help you manage your project on the go. 6. Crowdrise – Real world issues are addressed with Crowdrise so if you are into animal welfare, education, healthcare or cultural projects, this is the place to be. 7. PledgeMusic – This site is all about bringing new talent to the music industry. With a similar interface to Kickstarter, PledgeMusic is professional but simple to use. 8. Sellaband – Over 80 musicians and bands have been funded through the site. A nice thing about Sellaband is that artists can match the background design of their page to match their music making it a bit like MySpace, just with crowdfunding thrown in. 9. Appbackr – This site is all about getting funding for mobile device apps, and there is an app for getting funding for your app! 10. Crowdfunder – While most of the other sites target everybody from individuals to investment firms, Crowdfunder is aimed at helping US startups to raise capital through selling debt, equity and revenue-based securities while also attracting the attention of angel investors and venture capitalists. Well there you have it. One of these sites could be the key to turning your vision into a reality.